Score another one for Seoul while Silicon Valley slides. 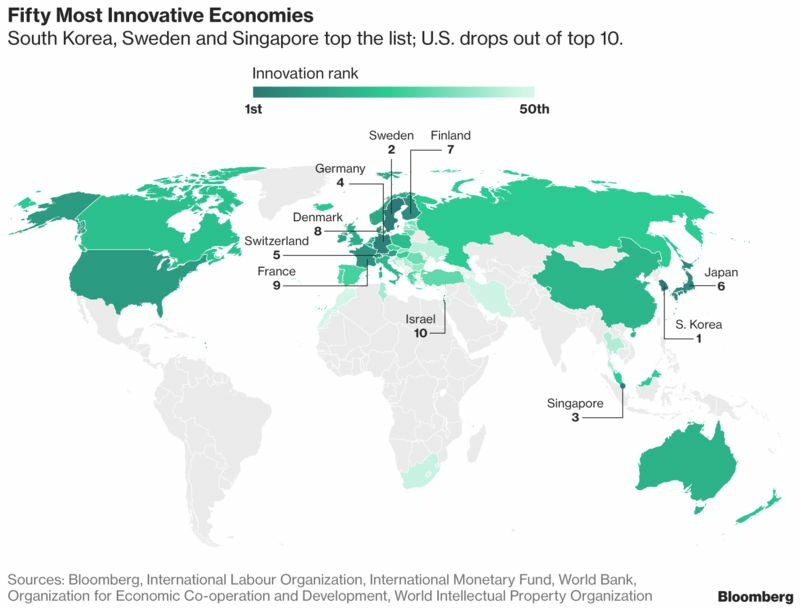 The U.S. dropped out of the top 10 in the 2018 Bloomberg Innovation Index for the first time in the six years the gauge has been compiled. South Korea and Sweden retained their No. 1 and No. 2 rankings. The index scores countries using seven criteria, including research and development spending and concentration of high-tech public companies. The U.S. fell to 11th place from ninth mainly because of an eight-spot slump in the post-secondary, or tertiary, education-efficiency category, which includes the share of new science and engineering graduates in the labor force. Value-added manufacturing also declined. Improvement in the productivity score couldn’t make up for the lost ground. Singapore jumped ahead of European economies Germany, Switzerland and Finland into third place on the strength of its top ranking in the tertiary-efficiency category. “Singapore has always placed strong focus on educating her populace, especially in STEM disciplines,” said Yeo Kiat Seng, professor and associate provost at the Singapore University of Technology and Design, referring to science, technology, engineering and mathematics. It also has a “steadfast commitment to funding R&D and innovation,” added Yeo, who holds 38 patents. 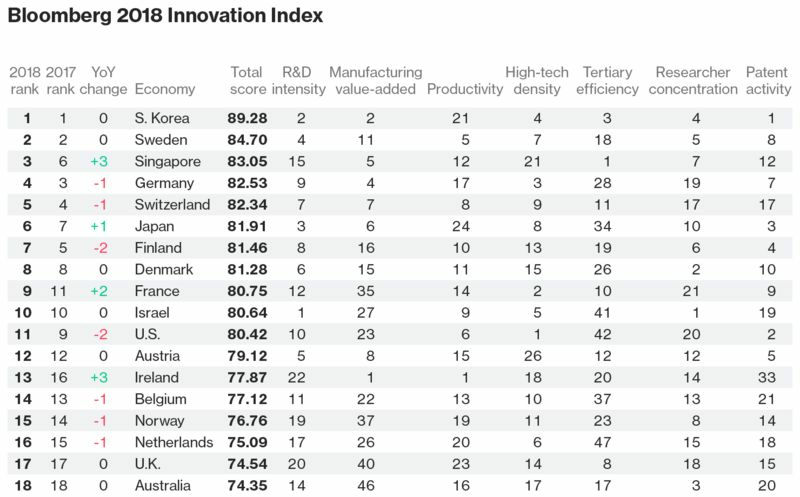 South Korea remained the global-innovation gold medalist for the fifth consecutive year. Samsung Electronics Co., the nation’s most-valuable company by market capitalization, has received more U.S. patents in the 2000s than any firm except International Business Machines Corp. And its semiconductors, smartphones and digital-media equipment spawned an ecosystem of Korean suppliers and partners similar to what Japan developed around Sony Corp. and Toyota Motor Corp.
China moved up two spots to 19th, buoyed by its high proportion of new science and engineering graduates in the labor force and increasing number of patents by innovators such as Huawei Technologies Co.
“One common trait of the U.S., Korea and China is that people accept failure as part of the process,” said Prinn Panitchpakdi, country head of CLSA Thailand, an Asian brokerage and investment group. “Innovation lags in countries where the culture emphasizes risk avoidance and where R&D is seen purely an expense, not an investment. That’s the mindset in Thailand.” It dropped one spot from a year earlier, to 45th. Japan, one of three Asian nations in the top 10, rose one slot to No. 6. France moved up to ninth from 11th, joining five other European economies in the top tier. Israel rounded out this group and was the only country to beat South Korea in the R&D category. South Africa and Iran moved back into the top 50; the last time both were included was 2014. Turkey was one of the biggest gainers, jumping four spots to 33rd because of improvements in tertiary efficiency, productivity and two other categories. 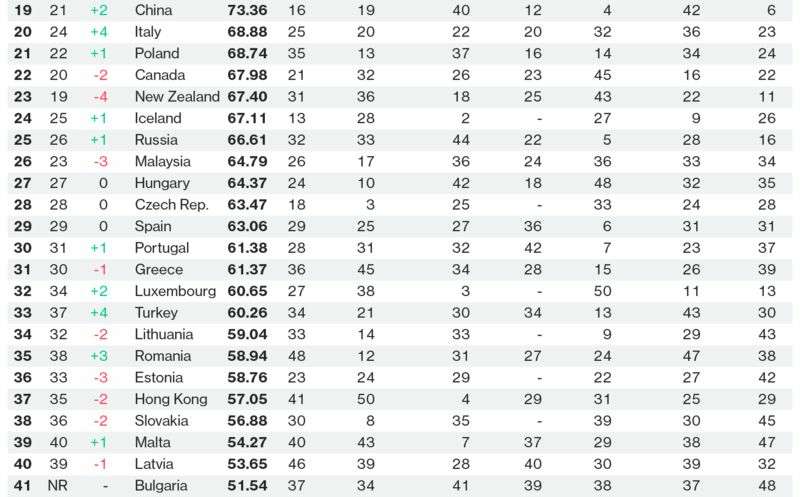 The biggest losers were New Zealand and Ukraine, which each dropped four places. 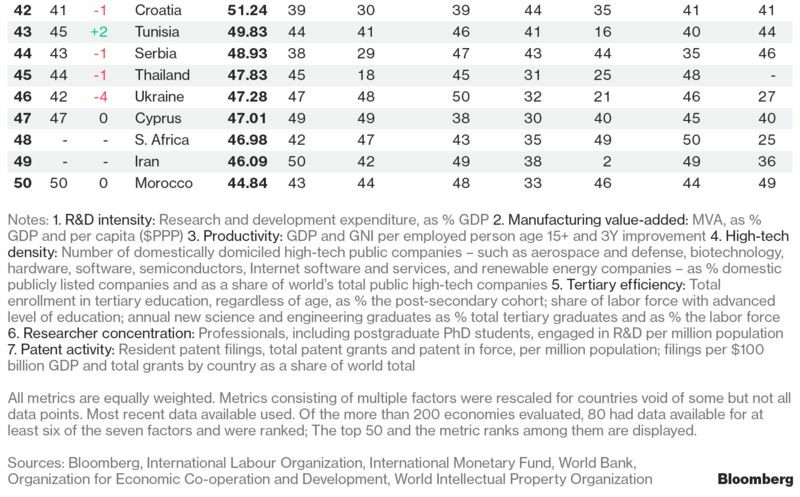 The productivity measure influenced New Zealand’s shift, while Ukraine was hurt by a lower tertiary-efficiency ranking. Movements in this year’s list were generally less dramatic than last year, when Russia took a 14-spot tumble following sanctions related to Ukraine and the plunge in energy prices. In the current index, it moved up one spot to 25th. The 2018 ranking process began with more than 200 economies. Each was scored on a 0-100 scale based on seven equally weighted categories. Nations that didn’t report data for at least six categories were eliminated, trimming the list to 80. Bloomberg released the top 50 and category scores within this cohort. For additional data, click here.